Cost is largely absent in the key debates around the use of unmanned drones in war, even though drones are a cost-effective way of achieving national security objectives. Many of the common objections to drones, such as their ambiguous place in humanitarian law, become second-tier issues when the cost benefits are laid out. For strategic military planners, cost efficiencies mean that economic outputs can be more effectively translated into hard military power. This means that good intentions concerned with restricting the use of drones are likely to remain secondary. This pattern of cost-trumping-all has historical precedents. The cheap English longbow rendered the expensive (but “honourable”) horse-and-knight combination redundant in the 14th century. Later, the simple and cost-effective design of the machine gun changed centuries of European military doctrine in just a few years. These basic principals are visible in the emergence of drones. For example, according to the American Security Project, unclassified reports show that the MQ-9 Reaper drone used for attacks in Pakistan has a single unit cost of US$6.48 million and an operational cost of close to US$3 million. This latter figure is deceptive, however, as a full drone “system” requires a larger infrastructure to operate. Therefore, a typical reaper drone in a group of four on an active mission requires two active pilots, a ground station, and a secured data link. However, even with this significant infrastructure requirement the end cost is US$3250 per hour of flight time. In contrast, the F-35 Joint Strike Fighter – which the Australian government recently announced it will buy 58 more of – costs nearly US$91 million per unit, almost US$5 million per year to operate and $16,500 per hour of flight. 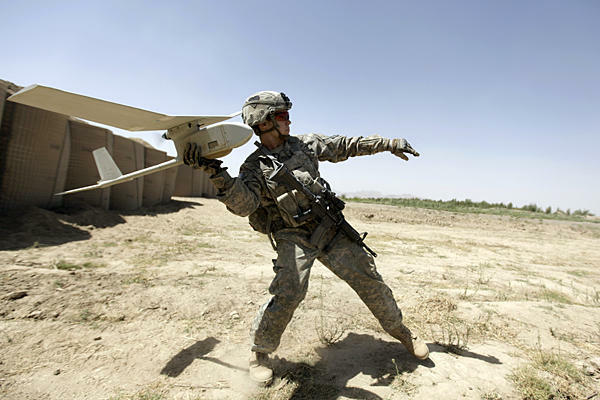 While drones will never completely replace soldiers, this debate is becoming less important in the current strategic climate. The operating environments where drones are deployed – countries such as Pakistan, Somalia and Yemen – do not emphasise “hearts and minds” strategies where the human element has traditionally been valued as a force multiplier. Instead, objectives in these countries involve attacks on specific individuals, with operational data obtained by signal intelligence beforehand. Human contact becomes even less desirable given that a key tactic of combatants in these weak states is attrition with the aim of creating low-level civil conflicts. The end goal of these actions is to inflict high economic costs to the adversary. As a result, this remote and analytical method of engaging militarily leads to substantial cost efficiencies. While military budgets get smaller, the cost of the human soldier remains expensive. For example, each US solider deployed in Afghanistan in 2012 cost the government US$2.1 million. These costs are only part of the picture, though. Thanks to medical advances, soldiers are now more likely to survive catastrophic battleground injuries than in the past. For instance, during the Iraq and Afghan operations there were seven injuries to each fatality compared to 2.3 in World War Two and 3.8 in World War One. This increasing likelihood of survival means a greater need for long-term support of veterans. US operations in the Middle East over the past 13 years have resulted in 1558 major limb amputations and 118,829 cases of post-traumatic stress disorder. There have also been 287,911 episodes of traumatic brain injury, often caused by a soldier’s close proximity to mortar attacks. The most serious of these injuries can incur more than 50 years of rehabilitation and medical costs, with most victims in their early 20s. For example a typical “polytrauma”, where a soldier has experienced multiple traumatic injuries, has a calculated annual health care cost of US$136,000. When rehabilitative hardware such as bionic legs is added – which can cost up to US$150,000 – the expeditures are considerable over a lifetime. These costs also peak 30 years after conflict and therefore are rarely viewed in context of current operations. Less severe and less obvious disabilities are even more frequent. Towards the end of 2012, 50% of US veterans from Iraq and Afghanistan (over 780,000), had filed disability claims ranging from military sexual trauma to mesothelioma. On top of this there are further hidden social costs: veterans account for 20% of US suicides, nearly 50,000 veterans are at risk of homelessness, and one in eight veterans between 2006 and 2008 were referred to counsellors for alcohol abuse. When these costs are combined, future medical outlay for veterans of the Iraq and Afghan missions are estimated to be US$836.1 billion. In this context, the benefits of solider-less modes of operation to military planners are clear. From this, we can see how the move towards drones is driven by cost. The US in particular is aware of the danger of choosing “guns over butter”, the economic analogy where there is always a trade-off between investment in defence and domestic prosperity. The US used this to its advantage in the Cold War when the Soviet leadership leaned too heavily towards “guns” by spending around 25% of its budget on defence in the early 1980s. As a result, the domestic economy collapsed and any defensive gains from increased spending were lost. America’s adversaries are also acquainted with this economic tactic. Osama bin Laden and al-Qaeda’s broader strategy was not to inflict damage to the US for the sake of damage itself. Rather, terrorism was part of a larger strategy of “bleeding America to the point of bankruptcy”. At the same time, China has been careful not to engage the US in a game of defence spending. It has been prudent in its expenditure, outlaying only 2.2% of its GDP on defence compared to 4.4% for the US. It is also focusing on a steady, rather than rapid collection of “traditional” defence tools, such as a blue water navy. This is because China is emphasising modernisation using new technology rather than the old metric of simple platform numbers. From this perspective, it seems US military planners have realised the perils of overspending. Drones are viewed as the remedy. Whether this contributes to or harms international stability is yet to be seen. Wayne McLean is an Associate Lecturer and doctoral candidate in the Politics and International Relations Program at the University of Tasmania. His current research explores the role of ‘pivotal’ middle powers in the international system using security driven neo-classical realist frameworks. This research reveals congruence across certain regional and international themes (such as balancing, hedging and activist foreign policies). His research interests include foreign policy analysis of Australia, Turkey, Mexico and Central Asia, alongside international relations theory, securitization discourse and the revolution in military affairs. These compliment his current role as a lecturer on political issues including party politics, electoral processes and campaign strategies in Tasmania, Australia and the US.